This is page one for a specialty area that focuses on accessories and items for custom chopper and bobber Japanese motorcycles. 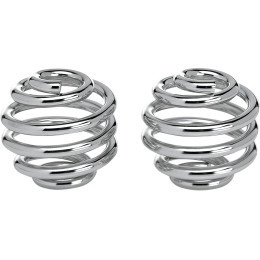 Most items can be also found in our main catalog. Click one of the links below to get started. Available for 7 inch and 5 3/4 inch headlights. 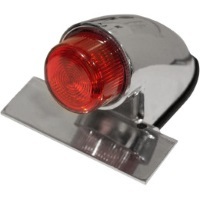 Cool polished aluminum Sparto style tail light/brake light assembly. Comes with a un-drilled four inch long tab for custom mounting license plate or signals. The ultimate in vintage tail-light design. Uses a dual element incandescent bulb. 6 1/2 inches long, 1 1/2 inches tall, 1 1/2 inches deep. Plastic body with beautiful chrome finish. 2 inch wide bolt studs on rear. 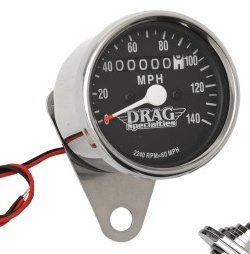 Comes with aluminum license plate mount that can be mounted on a fender or any number of ways. This is a beautiful chromed handlebar clamp that fits many early Honda and Kawasaki's. Clamp fits most CB350's-GL1100's from '69-'83 and Kawasaki KZ400-1100's '73-'83. Beautiful Billet Tear drop style mirrors made by Pro One. appr 5x2.75 inch mirror surface. 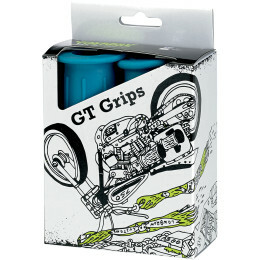 Comes with two different stem lengths and all the adapters for Honda, Kawasaki, Suzuki, Yamaha, and Harley applications. Nice and heavy to absorb shock and make for a clean view with little to no vibration. Beautiful chrome finish and great visibility for the size. Beautiful Golf Club style mirrors made by Pro One. appr 4x1.5 inch mirror surface. Cool looking Maltese Cross mirror with aluminum sculptured shafts and cast aluminum backs. 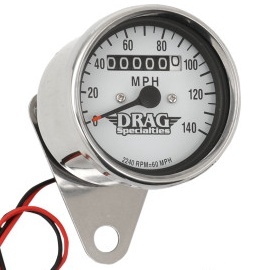 Nice and heavy for low vibration and good visibility. Mirror is appr 4 inch x 4 inch and 6 inch shafts that sit at a 45 degree angle. Here they are! 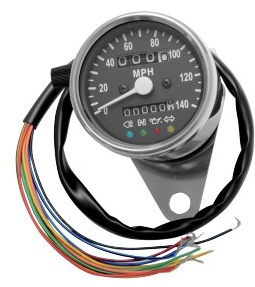 The original style polished stainless steel bezel and chrome body mini speedometers and mini tachometers with cable drives. 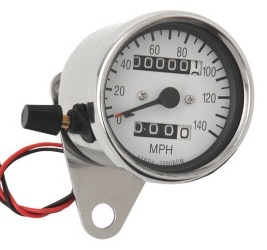 Speedo's register 140 mph and the tach's register 12000 rpm. They have black faces and light up with typical halo lighting with a replaceable bulb. The cable hook-up is the same as ALL major Japanese models early to present day. Sold individually below and available in different ratios. 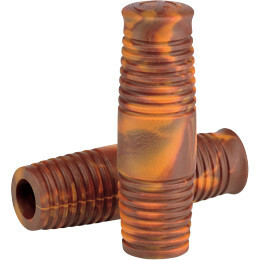 They all are appr 2 1/2 inch diameter (60mm) and are appr 3 inches long bodies. For some models you will need to do some research to figure out the proper ratio's needed. Handlebar mount clamp also included, but not pictured. 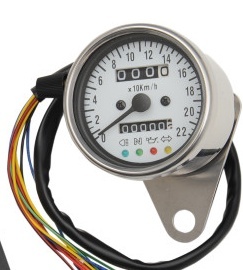 This is a 60 mm size mini speedo made just like the ones sold above this add, with the exception of the addition of 4 indicator lights built in. 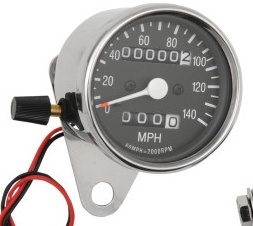 Now you can kill two birds with one stone and have a oil light, neutral light, signal indicator, and high beam indicator built right in!! 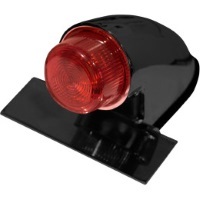 This is a cool vintage style tail light assembly. Base grounded with two hot leads, one for tail and one for brake light. Nuts screw onto threads on the back for mounting 60mm center to center. Total width appr 3.5 inches and 3 3/16 height, and appr 2 1/2 inches deep. Has clear spot in lens on bottom for license plate lighting. The REAL DEAL! Original Style Maltese Cross Tail Light Unit, Dual element tail light assy. 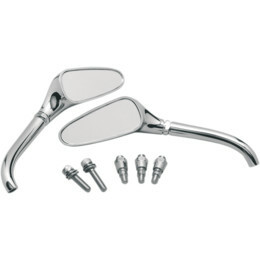 Chrome plated cast metal body. Traditional shape and size classic tombstone tail light. 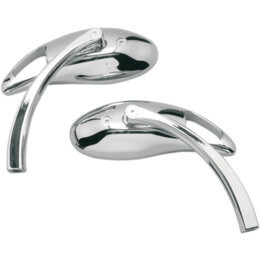 Heavy cast with beautiful show chrome finish. This is for the person who is looking for the ultimate unique tail light. It has a cool lens in the shape of a cat's face! Why just have a cat eye when you can have the whole face?! 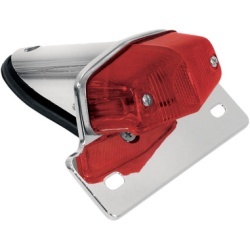 This is a classic style sport tail light/brake light with chrome mount that fits most rear fenders. Tab on rear to use for mounting license plate. You can also use he Lucas tail light or the cat face light with this unit. 5 inches wide and 2 1/2 inches deep. 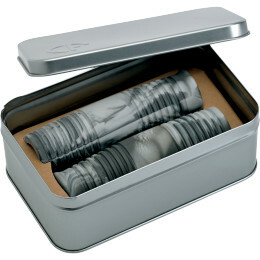 Made of die-cast metal with show-chrome finish. 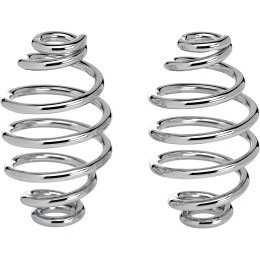 Has ribbed chrome body made of die cast metal. Clear lens with red skull. 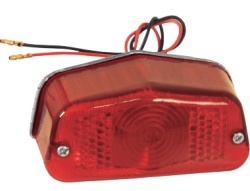 Grounded mount with dual element standard tail light bulb. Very high quality part with a unique look! This is the ultimate in sleekness. 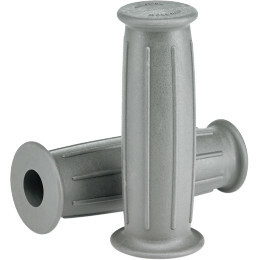 Withstands heat up to 2000 F Degrees 2 inch wide and 25 ft long and comes with four stainless ties. 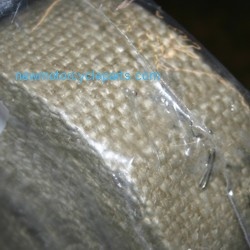 Available in natural as shown or black. 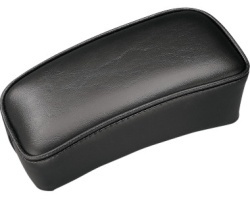 We carry these in 3 sizes. Also see out Hardware Page for More. 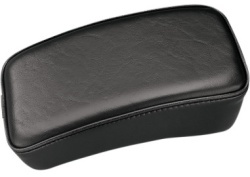 Solo Seat 9" wide with universal mount hardware. 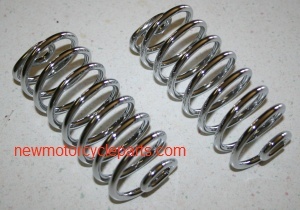 Can be mounted with springs listed below. 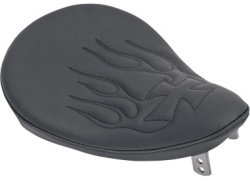 Larger Solo Seat Vinyl and riveted cover with heavy 16 gauge steel pan. Approximately 13 inches wide and 15 inches long. 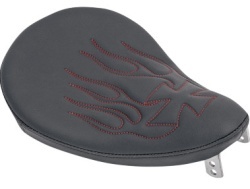 Very nice contour makes this a quality solo seat at a great price. 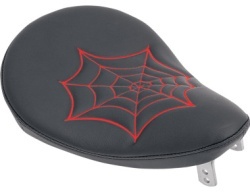 Universal solo seat front mount. 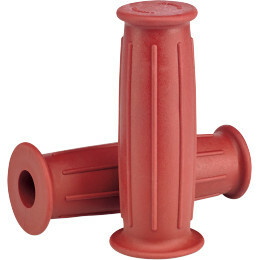 Appr 6 inches long with 1 1/2 inch slot. 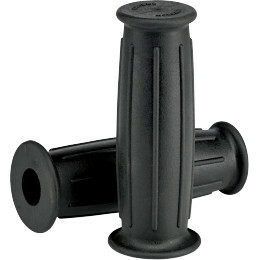 Universal solo seat front mount. 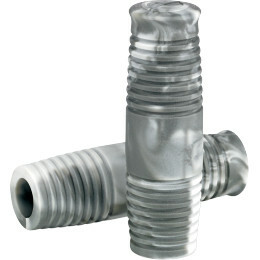 Appr 4 inches long with 1 1/2 inch slot. EK530 ZVX3 O-RING CHAIN WITH CHROME PLATING. 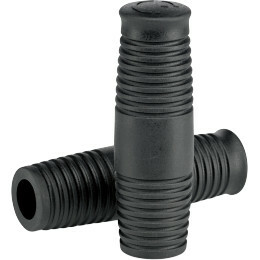 MADE FOR HEAVY DUTY APPLICATIONS AND RACING. Comes in 530 only and is available up to 160 links. Comes with a peen-on master link. Special Order item, extra 2-4 days delivery time. Rivit (peen style) Master link for Chrome EK530-ZVX Chain. 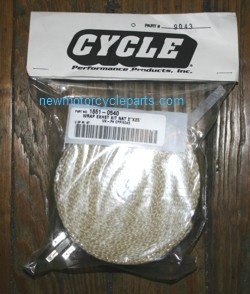 Works with 16" spoke conversion kits for 40 spoke sets Like CB750 Choppers. Special order item adds 3-4 business days to delivery time. Complete side mount assembly with taillight, license plate mount. 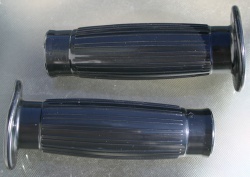 Mounts on left side of axel.